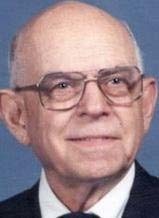 Russell H. Bisbing, 96, of Cedar Falls died Wednesday, January 17, 2007 at Sartori Memorial Hospital. Russell was born July 10, 1910 in West Union, Iowa, the son of Harry L. & Rebecca (Yearous) Bisbing. He married Anna Schultz December 2, 1938 at the Little Brown Church in Nashua, Iowa. She preceded him in death January 2, 1959. He married Grace Juhl June 17, 1967 in Marshalltown, Iowa. She preceded him in death February 14, 1983. Russell farmed for 22 years, was an auto mechanic and also worked for the Cedar Falls Street Department retiring in 1975. After retirement, he repaired small engines in his garage. Survivors include two daughters, Rebecca (Harry) Budensiek of Cedar Falls, Mary (Duane) Akeright of Cedar Falls; four stepsons: Richard (Joann) Juhl of Dike, Iowa, Ray (Paulette) Juhl of Bakersfield, California, Don (Pat) Juhl of Sun City, Arizona and Ron (Doris) Juhl of Surprise, Arizona; seven grandchildren, ten great grandchildren, three great great grandchildren, nine step grandchildren, fifteen step great grandchildren; and one sister, Amy (Rev. Paul) Huffman of Cedar Falls. Russell was preceded in death by his parents, both wives, an infant son, Russell Lane Bisbing, and two sisters, Winifred Nicholson and Florence Bisbing. Funeral services will be 11:00 a.m. Saturday, January 20, 2007 at Trinity Wesleyan Church with interment in Greenwood Cemetery. Visitation will from 4 to 8 p.m. Friday at the Dahl-Van Hove-Schoof Funeral Home with the family present from 6 to 8 p.m. Visitation will also be from 10:00 a.m. to 11:00 a.m. Saturday at the church. Memorials may be directed to the family.